An exclusive 649-foot glass oceanfront condominium will soar above Sunny Isles Beach, Fla. and boast practical technically-advanced amenities such as true robotic parking. The 47 story Muse Residences located at 17141 Collins Avenue in Sunny Isles Beach has reached the 37th floor of construction. Property Markets Group and S2 Development recently launched the Muse Inspiration Series with guest speaker Andres Oppenheimer. 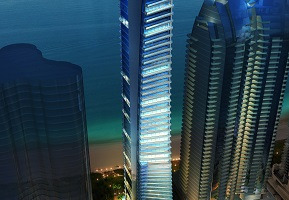 Property Markets Group and S2 Development broke ground on Muse Residences in Sunny Isles Beach last week. After pouring the foundation for Muse Residences in December, construction crews are working on the 10th floor of the Sunny Isles Beach condo tower. O Residences in Bay Harbor Islands will feature 41 condos with prices ranging from $600,000 to $1 million. S2 Development and its joint venture partners BH-LK Investment Group said Tuesday they have begun demolition for their 41-unit waterfront condo project in Bay Harbor. They’re old enough to tout great achievements, but not too old for fun. The Muse condominium tower broke ground in Sunny Isles Beach after co-developers PMG and S2 Development obtained a $133.7 million construction loan. Buyers of luxury condos have a new place to park their cash: in their parking spots. Stylish on the outside, state of the art on the inside. Developers are adding pricey new futuristic features to woo the Jetson set.